For clean, bright, and fresh laundry, use Persil Power-Liquid Intense Fresh laundry detergent. Persil Power-Liquid Intense Fresh gives you the stain-fighting power of Persil Original liquid detergent with an extremely fresh scent. Intense Fresh works great for everyday laundry, helping brighten and whiten your clothes and fight tough stains. You can use it in cold water and it works in all types of washing machines. Experience an exceptional deep clean every time with our Intense Fresh detergent. Persil Power-Liquid laundry detergent works in all washing machines, including HE and cleans effectively in all water temperatures. This package includes one 150-fluid-ounce bottle of Persil ProClean liquid laundry detergent in Intense Fresh scent, enough for 96 loads. Caution: Irritant. May be harmful if swallowed. Read cautions on back. Caution: Contains surfactants, enzymes and fragrance. Avoid contact with eyes. Do not ingest. First Aid: Eyes: Flush with water for at least 15 minutes. If irritation persists, contact a physician. Ingestion: Rinse mouth; give a large full glass of water or milk. Contact a physician. Keep out of reach of children. Instructions: . Optimized for great performance in all machines, including H.E. Measuring: For regular loads, fill cap to the top of line 1 (1.56 fl oz). Use more (2.5 fl oz) for heavily soiled or large loads. For Tough Stains: Pretreat by applying some detergent directly to stains and rub into fabric. Allow formula to sit on stains for 5 minutes. For added power, use 3/4 cap of detergent in wash. Directions: Follow care label instructions, then sort. Follow washing machine instructions for adding detergent. 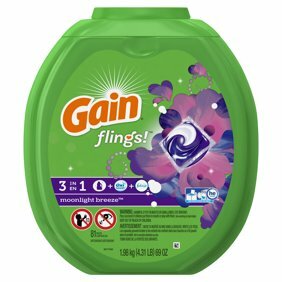 I absolutely love this detergent! I believe it's a little more costly than my old standby, Tide, but $1 and $2 off coupons are easily available and often on the detergent jug itself. My clothes smell heavenly now, and the scent lingers even after the clothes dryer, it's fresh and pleasant and not at all overpowering or cloying. 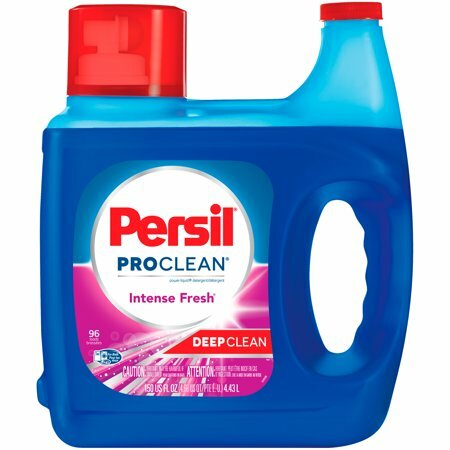 i live on a farm and I do laundry using extremely hard, mineral-laden well water, and Percil gets my clothes as clean or cleaner than anything I've tried in 40 years. Plus that glorious fragrance! My sister helped me hang some wash out to dry on the line and was so taken with the fresh smell that she bought Percil for her own laundry. This is hands down, the best detergent on the market. Your clothes are so clean and smell wonderful! :) This is the only detergent I will buy! I really like the Percell fresh scent washing liquid.. It cleans good and leaves clothes smelling clean and not like perfume.. I highly recommend this washing liquid and scent. I've tried some of the other Percell scents and do not care for them..
Let's get real, Tide is rated number one and has been teh "elite" laundry detergent for years. Then the US is introduced to the amazing Persil and Tide has been moved to #2. Love the smell and the cleaning power. Everyone should try this.